I stumbled across this picture over the weekend. 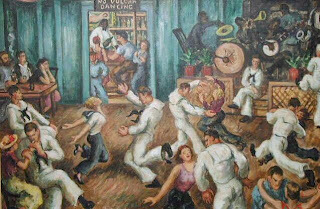 The Silver Slipper figures into the history of Sloppy Joe's, now a Key West tourist attraction, but a real saloon in the 1930's when this picture was painted (circa 1935) by Waldo Peirce. The painting is certainly evocative of an era, of a time in Key West that has been little chronicled in what history I've managed to read up until now. I discovered that there might have been another Silver Slipper at a later time. The address given is 215 Virginia St., which would put it in Bahama Village between Thomas and Emma Sts. I never saw that reference before which is going to lead me to do some more research. Incidentally, as I've mentioned before, I'm also posting at the Bahama Village web log on a variety of topics. 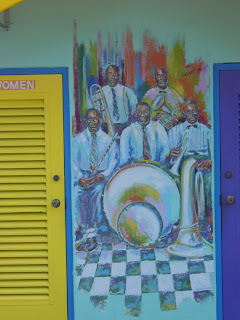 I hope to be able to reveal more of the history of Bahama Village. 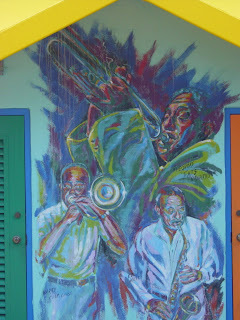 Here are a couple of images that I photographed myself, of some murals painted on the walls of Ed Swift's Bahama Market property on Whitehead and Petronia Streets. The property was to have been redeveloped into upscale housing but nothing has happened there in over a year now. The word was that he was offering it for sale as an unfinished parcel for someone else to develop. Whatever happens, it looks like the murals are going to wind up under the wrecker's ball someday. Too bad.